It will be for the thick tooth (1/8 size)., It will be for the thick tooth (1/8 size). This review is about item#36817751. This review is about item#36817742. 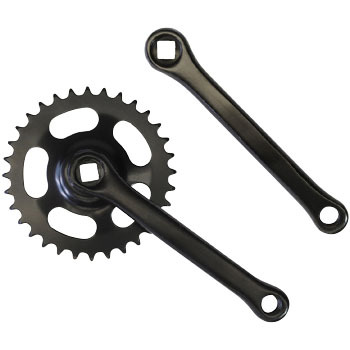 Although purchased as a new item, rust occurred in the right crank cotterless connection portion. It is very disappointing. Since it is an invisible place to the customer, I blew it off at the WD 40 and removed it, but before that I shipped things that had been rusting despite being a new product of OG (Osaka Gear Manufacturing Co., Ltd.) but I requested improvement but eventually It is said that improvement is insufficient at the moment. Please thoroughly control shipping. Exchange for the maintenance of rusty Mamariari. The quality of the crank surface was slightly uneven, but I did not care because it was black paint. There is no problem if rust disappears at this price. It was a good shopping. The bicycle which I bought at the home center rains in rain and rusts in red for half a year, so if you exchange for it, it will not rust for 2 years. Although some people may get lost as some people dislikes saying they are not fitting for review or processing because they do not carefully investigate standard manufacturer's products that do not match their own bicycles in the first place , Besides the cheap folding bike, I would like you to purchase it with confidence as it fits the standard as usual. It is strong and durable at an affordable price. It can not be installed without processing. This is for 1/2 x 1/8 chains. The width of the 7-speed bicycle (3/32) is large enough to fit. Since it can not be helped, I mounted it by scraping teeth with a grinder, but it is an important matter to write properly in item description. I thought that I should use returned goods once. It was after rust preventive painting. It is heavy, it has Bali, and it is cheap. 165 mm crank length. 32 teeth. First of all, I strongly desire a clear explanation of the item. Processing accuracy is problematic and strange. Rub resistance is a state of wait for a while. Completed goods that I can not imagine improvement points. Strong, precise and cheap.